If you're hunting for a casual yet sharp outfit, rock a light blue long sleeve shirt with navy chinos. Both garments are totally comfortable and will look great paired together. 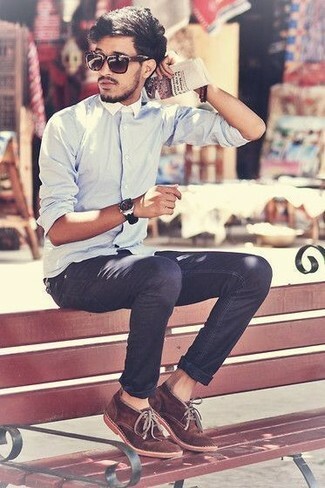 Dark brown suede desert boots complement this look very well. 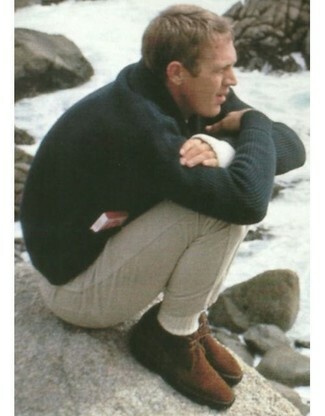 If you're searching for a casual yet seriously stylish getup, wear a charcoal cowl-neck sweater and beige jeans. Both pieces are totally comfortable and will look great paired together. When it comes to footwear, this outfit is round off brilliantly with Ted Baker London daiinos chukka boot. 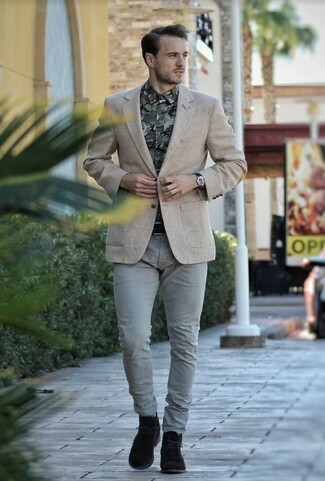 This combination of a beige wool blazer and grey chinos is super easy to pull together in seconds time, helping you look awesome and ready for anything without spending a ton of time rummaging through your wardrobe. Complete your ensemble with Ted Baker London daiinos chukka boot. If you're scouting for a casual yet seriously stylish ensemble, try pairing a black leather biker jacket with white chinos. Both garments are totally comfortable and will look great paired together. Bring instant interest and excitement to your getup with dark brown suede desert boots. For a nothing less than incredibly stylish outfit, make a tan raincoat and black dress pants your outfit choice. Break up your look with more casual shoes, like this pair of Ted Baker London daiinos chukka boot. If you're after a casual yet stylish outfit, choose a navy denim jacket and navy skinny jeans. Both pieces are totally comfortable and will look great together. Sporting a pair of Ted Baker London daiinos chukka boot is a simple way to add some flair to your getup. 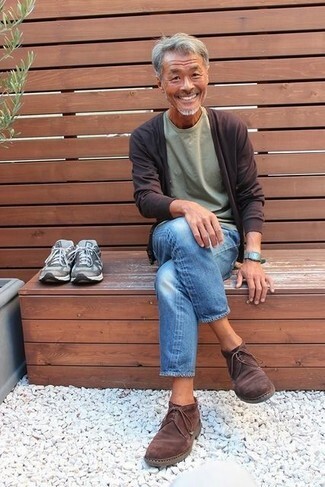 If you're scouting for a casual yet seriously stylish getup, go for a dark brown cardigan and blue jeans. As well as super comfortable, these pieces look great paired together. Complement your outfit with Ted Baker London Daiinos Chukka Boot from Nordstrom. If you don't like getting too predictable with your looks, pair a light violet plaid long sleeve shirt with light blue denim shorts. Rocking a pair of Ted Baker London daiinos chukka boot is an easy way to add extra flair to your getup. 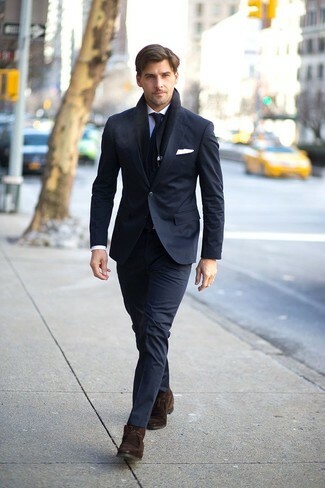 Wear a black suit and a light blue dress shirt for a sharp classy look. 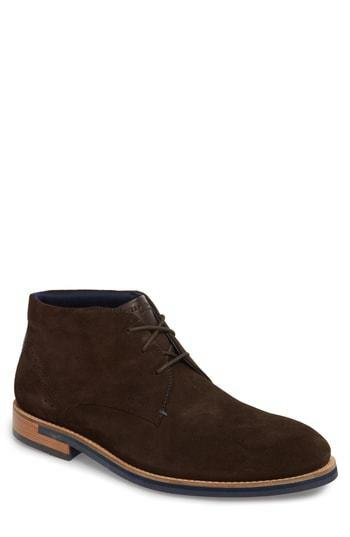 Ted Baker London daiinos chukka boot will add a more relaxed feel to your look.